Does the Bible speak of terrorism in the last days? August Rosado: As you know, right in my own backyard here in Massachusetts, our neck of the woods, a few weeks back the Boston Marathon bombing happened. Two brothers of Chechen origin with ties to some type of Islamic radical group there in Russia carried out a very heinous attack by setting up two explosives in pressure cookers. They detonated these bombs killing three people, one an eight year old child, and wounded over 200 people. Some lost arms and legs. Finally, one of the brothers died in a shoot-out with the police. The other brother is in federal custody. I've been getting a lot of emails related to the Boston Marathon bombing in relation to it being one of the signs of Bible prophecy. So, my question to you to start off is, does the Bible speak of terrorism in the last days as a fulfilment of Bible prophecy? Nathan Jones: To answer, let's first go to Luke 21. Jesus Christ in Luke 21, with parallel passages in Matthew 24 and Mark 13, gives us ten specific signs that we could look out for in the last days. There has definitely been parts of these ten signs through partial fulfillment that have occurred before the Temple fell in 70 AD, and again during the end times before Jesus comes in the Rapture. There will be final fulfillment of these ten signs during the Tribulation just before Jesus' Second Coming. The coming of these signs are like birth pains as they come more frequent and intense the closer until Jesus returns. This prophetic perspective tells us there is a near fulfillment during 70 AD, a far fulfillment at the end of the Church Age before the Rapture, and then a farther fulfillment which is during the Tribulation before the Second Coming of Christ. The first of those ten signs of the end times prophesies a great increase in false messiahs. Second, a great increase in wars. Third, a great increase in earthquakes. Fourth, a great increase in famines. Fifth, a great increase in pestilence. Sixth, a great increase in fearful events. Seventh, great signs coming from the sky. Eighth, a terrible persecution of Christians. Ninth, the fall and attack by the whole world which is focused on Jerusalem. And, number ten which is the good sign out of all ten signs, is the return of Jesus Christ, first by taking the Church up by the Rapture to where Jesus is in the clouds to be with Him to protect the Church from that horrible seven year Tribulation, and then again when Jesus returns at the end of the Tribulation in the Second Coming. Sign number six is the fearful events that will befall the world. Jesus is talking about fearful social events, say for instance, terrorism. He's also covering economic events as we are looking down the barrel of an impending economic collapse that will affect the whole planet. So, yes, I believe that when the Bible reveals there will be a great increase in upheavals and unrest, with nations fighting against nation, or ethnos/ethnic group against ethnic groups, and religion against religion, it is also talking about terrorism. I would say definitely yes, August, the Bible does indeed talk about how we will see a great increase in these types of fearful events happening upon the world, with terrorism then being part of those fearful social events. August Rosado: You mentioned Luke 21, but specifically verse 25-26, where Jesus says that there shall be signs in the sun, in the moon, and the stars upon the earth. He uses this phrase, "Distress on nations." That's very interesting that Jesus would use that term, because we are seeing this happen right now. Jesus says, "Distress on nations," then He uses this phrase, "with perplexity the sea and the waves roaring." Then in verse 26, Jesus reveals that, "Men's hearts failing them for fear." I sort of look at that as if Jesus was talking about heart failure. When you look at the 9/11 attacks of 12 years ago back in 2001, according to the Psychology Today website, two months after 9/11 there was a 35% increase in heart attacks. Even there at the Boston bombing there were reports of people suffering mild heart attacks. And yet, Jesus tells us in verse 26 of men's hearts failing them for fear as they look at these things which are coming on the earth, and that the powers of the heavens shall be shaken. So, I find it to be very interesting that Jesus would make that statement. 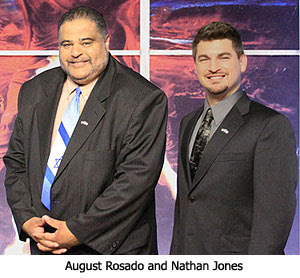 In the third segment of August Rosado's and my discussion of current prophetic trends and events, we will look at the stock market crash of 2008 and see if financial fear has in these last days prophesied in the Bible.